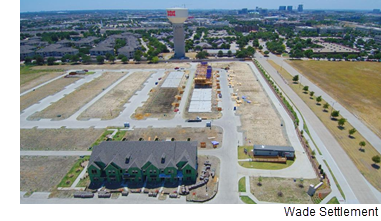 ​​ FRISCO – Megatel Homes plans to expand Wade Settlement, a townhome development at Parkwood Blvd. and SH 289. The homebuilder has acquired 100 finished lots from a competitor to build three- and four-bedroom townhomes. Megatel already has 200 lots under contract in the community. ARLINGTON: P. Lawler Enterprises purchased a 41,868-sf property at 631 106th St.
DALLAS: DA Rugs Inc. and Toro Deals Inc. leased 64,646 sf at 2525 Shiloh Rd., Ste. 200. FORT WORTH: KBW Property Ltd. sold a 149,981-sf property at 4801 Esco Dr. to Empire Roofing. FORT WORTH: International Industrial Contracting Corp. leased 40,000 sf at 3200 Randol Mill Rd. in Fort Worth. GRAND PRAIRIE: CCL Taiyi LLC sold a 90,432-sf property at 1908 110th St. in Grand Prairie to 110th Mercer Properties LLC. DALLAS: Crosscourt Capital and its affiliate North Texas Therapy & Home Care ​purchased a two-story, 29,000-sf office building at 17060 Dallas Pkwy. FORT WORTH: Fitness Connection leased 62,000 sf at Hulen Bend Village, 6080 S. Hulen St.